the book as well as the furry little boy! I love when a holiday dish can be an evergreen one and vice versa… this is an anytime meal perfect to pair with veggie pulp “No Meat-Balls” for a family that has committed vegans as well as meat-musters. Yes, I call them meat-musters because carnivores tend be as dogmatic about eating animal flesh as vegans are about not consuming animal products. It’s good for all come around one table to break bread and grow toward one another or at least enjoy eating together. Even this little guy hopes he can join in! He enjoys his animal protein but is glad he is not served up as a meal like his sister Contessa almost was in Korea before she became part of our fur-ever family. Find our more about them and the dog meat trade online! Rocky and Tessa got to eat some raw Kosher Turkey meat before they became these luscious balls full of flavor, so they got their gobble going, too! We all need more love and care…and I certainly need to practice more mindfulness, which recounting how this recipe came together helps me do while giving thanks for the experience in the now. Prepare all the veggies first. Chop onion, mince garlic, chop parsley and put in mixing bowl. Add cheese, bread crumbs, and tomato paste and then once that is thoroughly mixed together, add your meat and egg. Put your spices, shot of milk, and olive oil on top and mix this final mixture together, but don’t overdo as over-mixing can make the final result thick and tough instead of firm and tender. Mix by hand into large balls, coat with some olive oil for nice browning, and bake for 35-45 minutes. I feel awful when I waste food…good, organic, good-for-me food. And so I do whatever I can to NOT let goodness go bad. I had a bunch of pasture raised eggs and 6 imperfect granny smith apples that needed to get gone, so they mixed together to make a yummy treat for me and my pups Rocky the Rescue and Contessa Bear Smith! Yes… win-win for all! Optional version in front with main recipe muffins pictured in background. I wasn’t sure how it would turn out because sweeter, not tart, apples are typically used for baked breads and cakes, but I figured if the green goodies can go into pie, then why not a muffin?! Besides, it sounded fresh for Spring! Experiment challenge taken! Simple ingredients; easy recipe to try! =Heat oven to 350 degrees. =Add all wet ingredients (applesauce, coconut oil, eggs, honey, and vanilla paste) and mix by hand or mixer machine. =Sift together dry ingredients and combine with wet and mix thoroughly. =Scoop into silicone muffin molds or paper-lined muffin tins. These do not rise too much, so filling almost to top is fine. =Bake for 20-25 minutes… I ended up going close to 25 minutes. =Optional: save a scoop of batter, add date paste of 5 Medjool dates, and 1/4 up of GF oats and mash together. Take a little bit and mix this mash onto the top of each muffin batter in the tins or mold. This will bake for at least 25 minutes. It’s just a little bit sweeter and has a nice touch of texture that delights. =BONUS! This was baked with our best pup pals in mind! 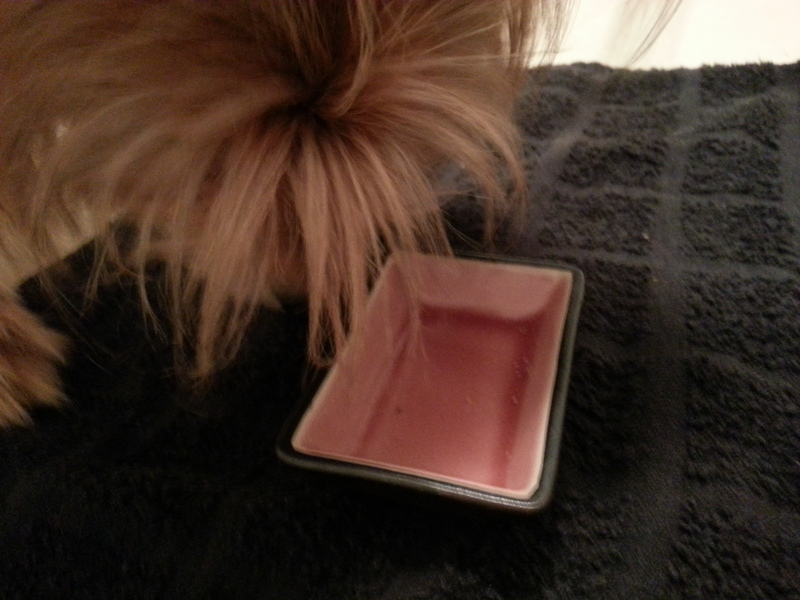 My two rescues licked their plates clean… If your pup likes apples, this will be a great treat to enjoy together! oh please make the waiting stop! =FOOD TRIVIA: Did you know that various sources say it takes anywhere from 55 to 120 gallons to produce one egg? I imagine the wide range is for the allowances from conventional to biodynamic farming… and everything in between. Nevertheless, it’s best to eat up what you get and avoid wasting food and resources it takes to produce that food…for the love of people and our planet! Baked well, yet not tough or dry. Winner! I call one of my rescue pups named Tessa “my roley-poley pumpkin muffin.” As silly as that sounds, she inspired me to make a pumpkin muffin my pups can enjoy along with me… and so here’s what love for my furbabies yielded. This is the base recipe for the pumpkin muffins… It starts out Paleo for those who want that, but can become what you need and crave with the optional swaps. One version is a pup-friendly option that is super easy! This makes this a must-have and must-do recipe for any health-conscious dog lover! options if just for peeps: date crystals, nuts, raisins, chocolate chips. 1- preheat oven to 350 degrees. 5- FYI: Almond flour versions take about 21 minutes…test and be sure because they are very moist and may need more time. The buckwheat flour versions will also be about 21+ minutes to bake. These will rise more like standard muffins and brown easily. optional: add cup of soaked raisins and chocolate chips. Leave enough raisins to add garnish atop each muffin or use nuts instead for added texture and decor. other option: sprinkle date crystals atop each muffin for plain versions like the puppy version to add a bit more natural sweetness. It’s important to substitute the almond flour which makes the base recipe a paleo version for people because dogs don’t do well with high fat in their diets. The coconut oil is a healthy fat and plenty for them. Plus, just using date paste is sweet enough for some people and definitely enough for pups…and leaving out the salt is very important since less is best for pups. The puppy version is actually quite delicious and I found myself wanting the doggie version more than the sweeter human-designed version! Seriously! Lastly, I love the puppy version using buckwheat flour instead of almond flour… just enough of everything–heartiness, flavor, and health value! It’s a fruit’s seed, not any kind of wheat, so it is gluten free! Here are some other compelling reasons to try it: buckwheat flour benefits . Puppy version taste good and is worth the wait! TREAT for PUPS and PEEPS for WORLD ANIMAL DAY! As part of #WORLDANIMALDAY (October 4th,) let’s give our furriest friends some extra love! To be honest, though, I give my beloved pups healthy treats very often… sometimes earned, but sometimes just because I love them immeasurably. If you’re an animal-lover, one of the recent buzz phrases is “human-grade” food for dogs. Well, with our world full of commercialized pseudo-foods, it’s hard to make heads or tails (couldn’t help it) out of that. That’s why homemade meals and snacks with sustainably sourced ingredients are so key to our health and that of our loved ones! Super quick and super easy… try this simple recipe for FROYO FOR PUPS! They are so well behaved, I can’t help but love them more! Mash up the fruit in a bowl, add yogurt and mix together. Add peanut butter and mix again. Pour into bowls ready to freeze. Sprinkle each with flax seed. Freeze and pull out anytime for you and your pups! You can add these frozen gems to your own smoothies. I LOVE THAT MY FURBABIES AND I CAN SHARE A HEALTHY TREAT!! If your pup is extra finicky, increase the amount of peanut butter by 1/2 cup and decrease the fruit. I let Rocky and Tessa lick up the bowls and they couldn’t get enough! I like to offer extra special treats like this for the times I need to leave the house…it makes them happy and occupies them for a bit. ENJOY THE LOVE AND SHARED SWEETNESS WITH YOUR PUP! You can see how much these pups love this treat on a video to be released on World Animal Day http://www.instagram.com/eatscommunity.org ! 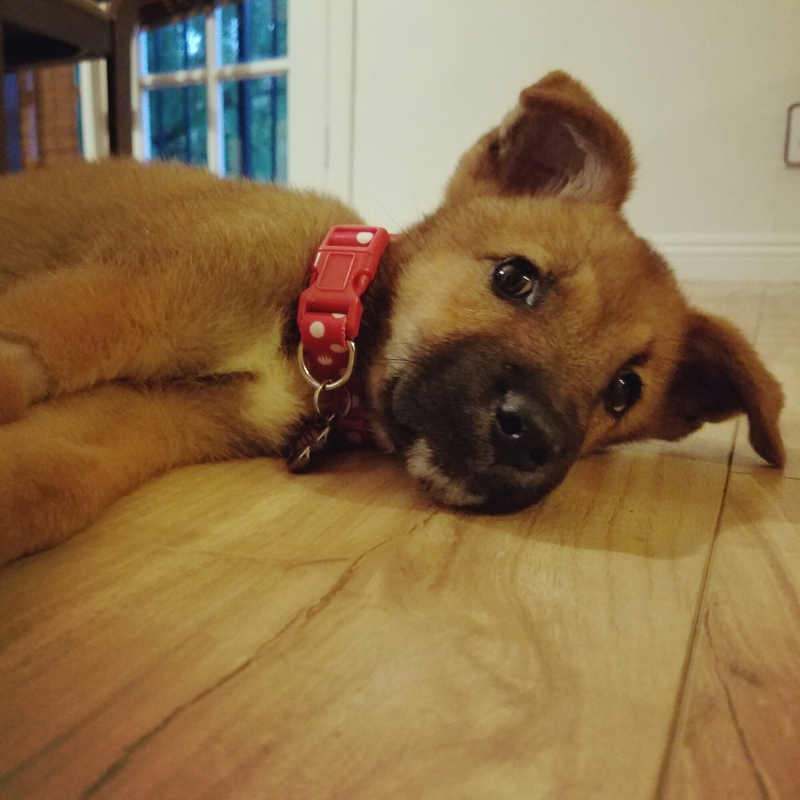 Baby Tessa…saved from slaughter in the Korean dog meat trade. When asked to write the “success story” about Contessa Bear Smith, all I could think is that her rescue is a collaborative celebration in a series of devoted work and sacrifices of others. Tessa truly is a precious addition to my life as she is a thriving survivor rescued from slaughter in the Korean dog meat trade. As a Korean-born naturalized U.S. citizen, I find a great deal of shame in the unconscionable appetites of those in Korea and around the world where cultural superstitions heap wretched atrocities and harm on those least able to protect and speak up for themselves. There is an absurd wives’ tale that says inflicting suffering upon an animal makes their brutalized flesh taste better and reduces the imbalance of heat in the consumers’ body. How is that considered sound, rational thinking? I honor those like Nami Kim, outliers of institutionalized power and social environs, who dare to take a stand against outdated, ignorant, and barbaric practices, often going stealth and enduring ridicule, abuse, and loss of all that are comforts in life for the sake of a greater cause. And what greater mission could there be than to champion innocence–bearers of pure love and the rescue and preservation of the same? Activists like Nami Kim lay down their own needs because they fight for others who can still have a chance at living a full life without the wounds of abuse, neglect, deep pain and in so doing call out to the best nature in every sentient being. To me, my baby girl Tessa and her fellow rescues are living testimonies that people can choose to walk out compassion and cherish all living things and therefore elevate our brief journey in this world. Hats off with all my heart to animal activists like Nami Kim who worked with Wags and Walks to save not only Tessa but many others! The numbers are out there…in the endless array of fact-finding you can do about the worldwide dog meat trade. I will spare you the staggering numbers, but suffice it to say that lack of conscience and over-consumption undergird the ongoing brutality. As a realist, I know the abuse toward others (human or not) will not cease in our current dystopia, but we can fight with and within current structures of governance to curtail much of its worst manifestations…and bring offenders to justice to help prevent others. I applaud Nami Kim’s approach – to save all she can with boots on the ground while using publicity and people en masse to apply pressure to enforce standing laws that are supposed to prohibit causing suffering of these animals. This is compassion in the real world with real effect–a place we can all begin to make change on solid footing until every human by their free-will educated choice make conscious choices that serve the great good than just their own gain. Tessa is still getting adjusted in her new forever home with a big brother who was not quite ready for her. To be honest, neither was I! Rocky the Rescue puzzles over his sister. Completely happy with my only fur-kid Rocky Bear Smith who is also a rescue saved by Dogs Without Borders after someone threw his litter out in a garbage bag to die, my husband and I could not imagine adding another pup to my home. 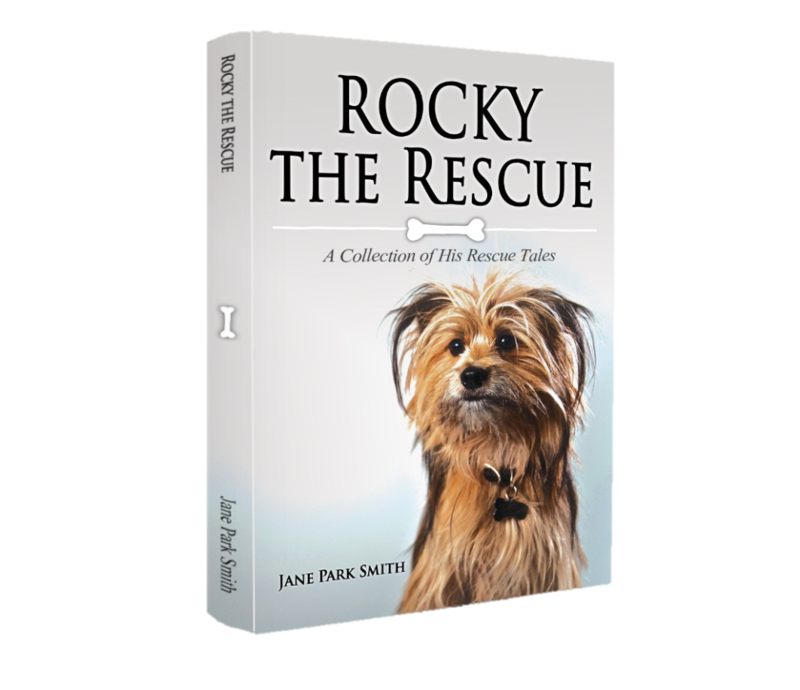 Also known as Rocky The Rescue for his on-set work in film and television and for contributions back to animal rescue through his book, I felt I could not have had a sweet and more content life with a dog. However, in seeing how Tessa became my baby girl, it is a blessing from the Maker of all creation. I am reminded that the sweetest gifts are often unexpected, specific…swift to capture your entirety. We were both watching the documentary about dog farm rescues. See links below. Thank you for reading this, and I would like to share links for you to explore ways that you are led to lend your support to rescuing most deserving creatures around the world. If not for the animals, themselves, think toward offering your boost of morale to activists who undoubtedly could use support to continue their relentless fight. From cute to hilarious, Tessa is captivating! Lots of blessings to you! 2 peeps ‘n 2 pups: Jon, Tessa, Rocky, & me! Freebie!!! Giving away ROCKY THE RESCUE! Go to this link and sign up for the drawing…! Spread some goodness around this month by raising awareness about the value of all living creatures and how best to make them truly part of our families, fill one another’s hearts, and make a safe and beautiful home together. Rocky has changed my life… perhaps he can brighten your day or uplift someone you love? Spread the word and sign up for the freebie … giving away the book only, of course! The one and only ROCKY–furry love of mine is in my home and heart to stay! As Rocky and I love to live and share … keep our motto in mind! …GIVE THANKS – GET HAPPY! ROCKY THE RESCUE is published by http://www.abelievingcompany.com . Here’s one! 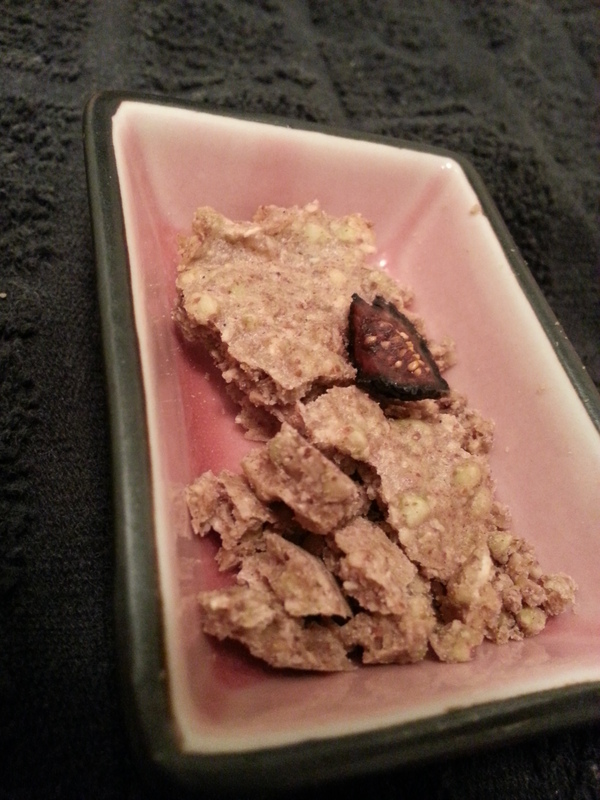 A gluten free crumbley cereal “bark” that is satisfying enough for me and my doggie! Have you seen the ingredients on most doggie cookies and treats! Mystify and gag me! yuck! But this way, I can enjoy a great at home, ingredient-controlled treat WITH my furry love. (option… you can use honey instead of stevia if you are concerned about your doggie’s digestive system and you are okay with honey’s higher glycemic index)…but that is why I love cinnamon in abundance to help offset some sugar spikes. 2- Pour onto you dehydrator’s teflex sheet. if you want to “score” it for uniform breaking later, you can do so with a knife or pizza cutter a few hours into the dehyrating. 3-Dehydrate for 10 hours at 118 or so (set your machine to about 125 since enough heat dissipates and won’t reach that degree. 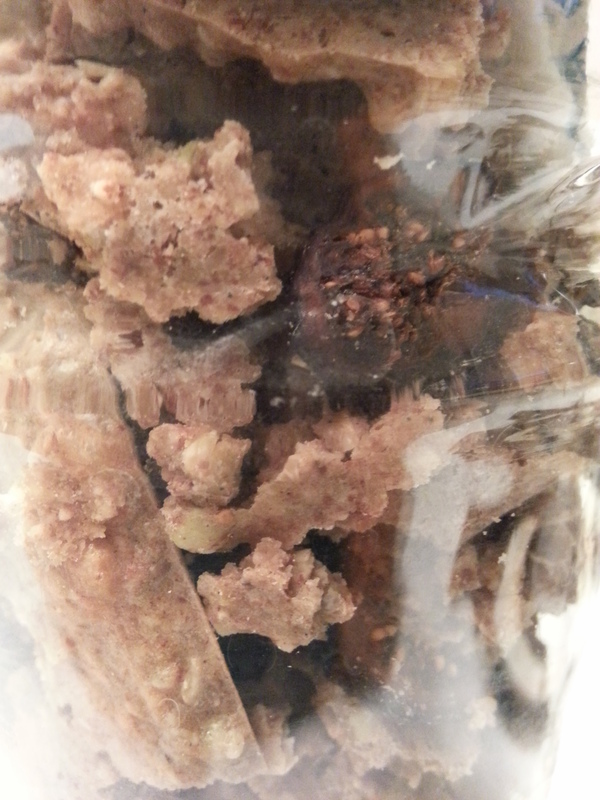 4- Flip onto your other teflex sheet and dehydrate some more… another 8 hours or so. Or until it’s irresistably crunchy!!! 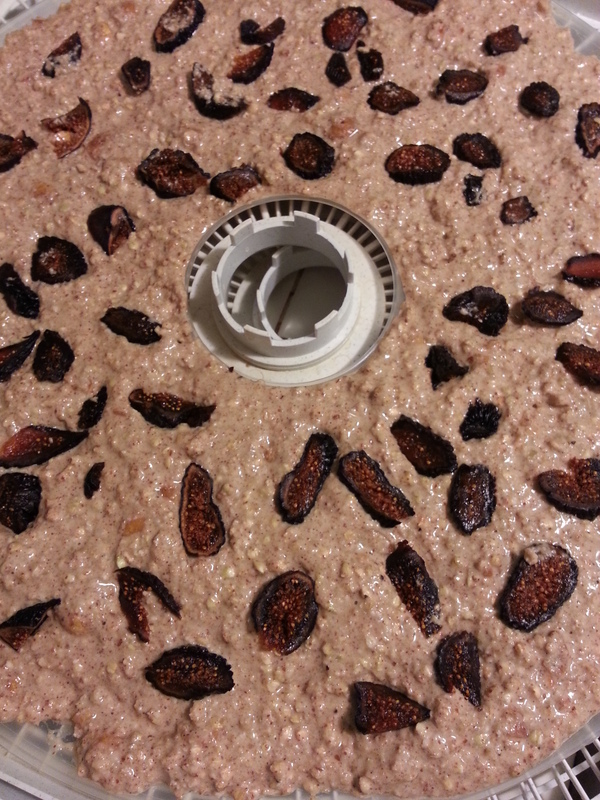 I love and hate when my dehydrator is going because I love sampling, sampling, sampling under my guise of testing… haha! 5- Remove and let cool and break into pieces or follow your scoring. Here’s the compromise. This recipe may not be sweet enough for the average American palate, but plenty sweet enough to satisfy your doggie safely. So, you can eat this with more dried fruit when having as a cereal or topped with a banana or other sweetener of choice. Or, just train yourself to enjoy the simple tastes of simple ingredients and break the standard sugar craving needs built upon a food industry that has put sugar in virtually every food under various names. (Don’t get me started). Plus, your doggie companion would probably enjoy being able to share more of what you eat without harm…and can do so if our human food choices were more basic and deliciously healthy! Go ahead… share a bowl of this cereal (even with milk of choice)… one big bowl for you; one appropriately sized bowl for Rocky. I am so happy he loved it… and ate it all up! Proof that humans and dogs can really be besties and share more! GUILT FREE, GLUTEN-FREE LIVING WITH OUR FURRIEST FRIENDS!!! And here’s some information on why you should incorporate buckwheat groats into your routine!! !…and it’s not a wheat!!! It’s a fruit seed that’s related to rhubarb and sorrel, so it’s gluten-free, making it a popular substitute for other wheat-based grains. Though it is usually thought of as a grain, buckwheat is actually the seed of a broadleaf plant related to rhubarb. While it is not a true grain, it is used like one in cooking, and it surpasses rice, wheat and corn on almost every measure of healthfulness (including the fact that rice, wheat, and corn are high on the glycemic scale, thus provoking a quick spike in blood sugar levels, a proven promoter of systemic inflammation). Buckwheat, on the other hand, ranks low on the glycemic scale. The fruit seed originated in China and spread to Europe and Russia, where it’s often eaten as porridge. However, buckwheat has found a home in the West Virginia region, where it’s been celebrated for years at an annual buckwheat festival. Buckwheat is also high in manganese, magnesium, copper, and zinc, which are great for the immune system. It also contains all eight essential amino acids, including lysine, which plays a key role in collagen production and is not produced by the human body. Ramirez says people prone to cold sores should try eating buckwheat, since lysine helps wear them off. How to select: Buckwheat comes in various forms, so it helps to know what you want to use it for before heading to the grocery store. For raw buckwheat, or buckwheat groats, head to the bulk bins area of the store. You can also find groats packaged. For baking, buckwheat flour is packaged and readily available at most stores. There are also buckwheat noodles, also known as soba noodles, which can be found in the gluten-free section of grocery stores. =The specific characteristics of buckwheat proteins, and the relative proportions of its amino acids, make buckwheat the unsurpassed cholesterol-lowering food studied to date. =Its protein characteristics also enhance buckwheat’s ability to reduce and stabilize blood sugar levels following meals—a key factor in preventing diabetes and obesity. =Like the widely prescribed “ACE” hypertension drugs, buckwheat proteins reduce the activity of angiotensin converting enzyme (ACE), thereby reducing hypertension.